Your one stop visual graphics shop. I am dedicated to your vision. Using clear communication I will work with you through every stage of the creative process, from concept to implementation and delivery. Working with industry professionals and photography enthusiasts, I pride myself on using a high-skill set, attention to detail and professional attitude. Quality is the cornerstone of my business. Custom photography. $125 / hour + expenses + retouching. Our non-destructive editing ensures quick and easy revisions if needed. Need an inkjet print? We have a solution for you. 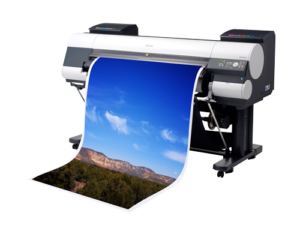 Our 44″ wide roll printer can get the job done. Commercial retouching makes your photos look their best at $100 / hour. Calibrated workstations guarantee you get an accurate result every time. We can quickly help you set up an online portfolio using our partner web services. Get the most detail and sharpness out of your film and prints with our professional scanners. All our work is timed using productivity software, you get charged only what time we use. Know your completed job is going to you and your clients safely via WeTransfer. 16Bit workflow provides the utmost detail from processing to completion. Sometimes emails just do not convey your vision, personal review helps to finalize it. G.T.A. only. Images will be clearly labeled upon delivery, and stored in our archive for a minimum of 6 months. Have an idea for a new project or need some new marketing material? Get a quote for some custom photography today. All photography services are charged at $125/hour + expenses + retouching. Professional retouching services enhance and refine your images making them look their best. Retouching is a collaborative effort. Your vision, my skills. $100/hr. Are you or your client looking to design a brochure or flyer with your images? Make it look modern and sleek by removing ugly backgrounds. The “magic wand” will not do; close cutting services are for you! Extract those pesky hairs and make your product look great. Tired of disappointing results when you print? Use our calibrated printing services for accurate prints. Our printing is split into three categories. Tier 1 Matte | Bond $15.00 / Sq-Ft. Tier 2 Satin | Glossy $18.00 / Sq-Ft. Tier 3 Fine Art | Metallic $24.00 / Sq-Ft. Whether exhibiting at a gallery show or sending RGB or CMYK proofs to your client, our Canon iPF8100 44″ printer can get the job done. Tight quality control ensures your print order is accurate. Click here for a list of standard print prices. Looking to create a book? Using outsourced book publishers we can help you design a book to get that project published. Need a quick portfolio up online? With a quick wordpress template we can have you share your images with the rest of the world. Some examples include: AlbertiPhoto.com, BlairKrusePhoto.com, and PCSheppard.com. Our optional online review system makes it easy to collaborate during the creative process. All parties can mark up, compare, and comment on the images during the digital imaging process. Our system supports multiple users at one time, so you can add your client and forget about being the middleman for communication between all parties involved. Professional images demand perfect colour; our entire workflow is custom profiled for accurate colour, from on-screen review to in-house printing. A 16bit workflow is kept throughout the digital imaging process providing the highest level of quality. Looking to send your project to press? Are you publishing a book or printing a bulk order? Well hold on for just one moment! Your images are in RGB. Doing a proper conversion is essential for accurate colour representation, both in the file and the final product itself. We can provide colour accurate proofs. Conversion to CMYK is an essential step to achieve accurate results. File management can be a headache if not done correctly. Simply by moving files that are not renamed you can accidentally overwrite your finished version. We rename all of our completed images into the following categories. 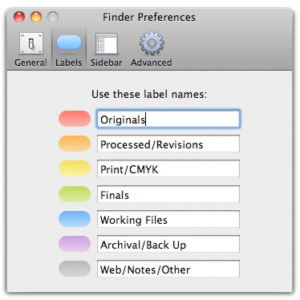 Mac OSX users will be able to view their completed images with particular coloured tags to help with file management. Upload and receive your files using WeTransfer. Send all files to info@imagingtree.com. Your order can be shipped via Courier (in GTA) or internationally via the mail. Delivery rates are based on courier/shipping costs, which can be estimated during the quote. Rest assured your project is safe and secure for a minimum of 6 months after job completion. Video production and editing is not my expertise, but I am always keen to expand my video portfolio and learn new skills.